For those uninitiated in “Beaujolais Day,” it’s when the current year’s vintage of Beaujolais Nouveau is released. Beaujolais Nouveau is made from Gamay grapes that are grown in the Beaujolais region of France. To make the wine, once harvested, the grapes undergo carbonic maceration, which is whole berry fermentation that creates fruity, low-tannic wine that sometimes has hints of a bubble gum-like flavor. The wine is shipped and ready to drink just 6-8 weeks after the harvest. Admittedly, much of the hoopla surrounding Beaujolais Day is the result of wonderful marketing. The wine itself is usually average, but it’s release signals the start of the holiday season. How can that not excite you? 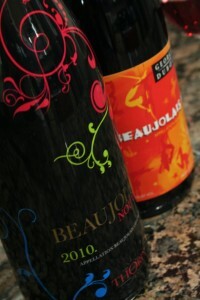 This year, I was a little over-excited purchased several bottles of Beaujolais Nouveau. In addition to my traditional Georges DuBoeuf, I also picked up a bottle of the Maison Thorin. The 2010 Maison Thorin Beaujolais Nouveau was a light, ruby color with purple flecks. On the nose, there were strawberries, cherries, and Pixy Stix dust. In the mouth, there were tart strawberries, cherry limeade, and twigs. The wine had low tannins, a light body, and very high acidity. Is this worth a glass after work? No…it’s not worth dirtying a perfectly clean wine glass. Even at $10, this wine was a huge disappointment, and if this is what people think of when they imagine Beaujolais Nouveau, it’s no wonder that there can be such hostility towards the wine. Unfortunately, after a few sips, I not only dumped my glass out, but also the entire bottle. This wine was undrinkable. 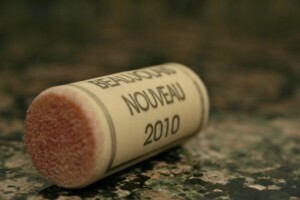 The 2010 Georges DuBoeuf Beaujolais Nouveau (winery) was a medium purple with ruby flecks. On the nose, there were cherries, raspberries, and red apples. In the mouth, there were cherries, cherry limeade, grapefruits, and strawberry SweeTarts. The wine had low tannins, a light-to-medium body, and bright acidity. There was also a touch of effervescence in both bottles that I opened. Is this worth a glass after work? Sure…you won’t be drinking anything out of the ordinary, but you’ll have a decent, reliable glass of wine. For $10, this wine is well balanced, fresh, and fruity. There’s no question that it’s a simple, young wine, but it was the perfect pairing for Thanksgiving leftovers and a festive accompaniment when Hubby and I put up our Christmas tree and put out the Chanukkah decorations. 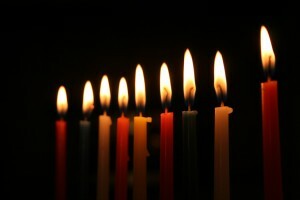 is having a wonderful start to the holiday season! Ooh, I am glad I went for the DuBoeuf instead of the other bottle that Costco had when I got mine! I don’t remember what it was but it sounds like the Maison Thorin was pretty awful. The DuBoeuf was definitely the way to go. Hope you enjoyed it…and happy holidays to you too! A little disappointed that the Georges Dubceuf Beaujoliais Nouveau has a screw top instead of a cork. Feel like I’m buying a $3.00 bottle of wine instead of $10.00.